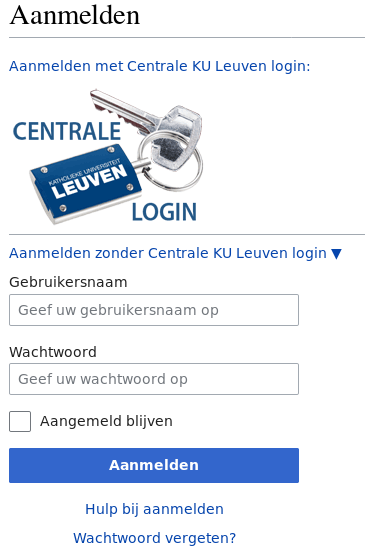 Difference between revisions of "Securing MediaWiki using Centrale KU Leuven Login"
Before installing, you need to have SSL and Shibboleth (Centrale KU Leuven) login enabled on your domain. First unzip the zip file in your <code><mediawiki root>/extensions/</code> directory. If you want to allow anonymous editing, you should <b>not</b> add the last 4 lines of the previous paragraph. If you want to allow anonymous editing, you should <b>not</b> add the last 4 lines of the previous paragraph. Though this really defeats the purpose of the extension. MediaWikiShibboleth has 3 configuration options which allow for restricting who can log in to your wiki. 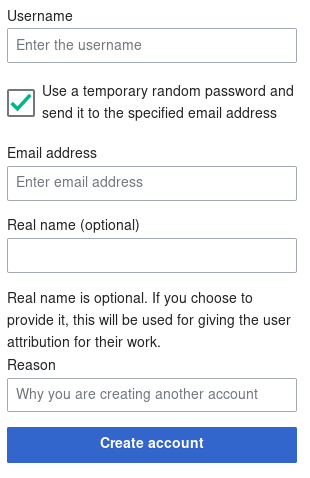 These options work especially well with restricting the access of the wiki to logged-in users only. They can be configured in the <code><mediawiki installation folder>/extensions/MediaWikiShibboleth/extension.json</code> file. to <code><mediawiki installation folder>/LocalSettings.php</code>. If you combine this option with "Restricting access to logged-in users only", only students will be able to view, log in and edit your wiki. to <code><mediawiki installation folder>/LocalSettings.php</code>. You can add as many KUL ids as you like, separated by a comma. to <code><mediawiki installation folder>/LocalSettings.php</code>. You can add as many degree numbers as you like, separated by a comma. It's possible to translate and modify all public MediaWikiShibboleth messages. The translations can be found in the <code><mediawiki installation folder>/extensions/MediaWikiShibboleth/i18n</code>. Dutch (<code>nl.json</code>) and English (<code>en.json</code>) translations are already provided. Even the provided translations can be customized, and we strongly advise you to do so, in order to match them with your Wiki situation. If you want to allow anonymous editing, you should not add the last 4 lines of the previous paragraph. Though this really defeats the purpose of the extension. MediaWikiShibboleth has 3 configuration options which allow for restricting who can log in to your wiki. These options work especially well with restricting the access of the wiki to logged-in users only. They can be configured in the <mediawiki installation folder>/extensions/MediaWikiShibboleth/extension.json file. to <mediawiki installation folder>/LocalSettings.php. If you combine this option with "Restricting access to logged-in users only", only students will be able to view, log in and edit your wiki. to <mediawiki installation folder>/LocalSettings.php. You can add as many KUL ids as you like, separated by a comma. to <mediawiki installation folder>/LocalSettings.php. You can add as many degree numbers as you like, separated by a comma. It's possible to translate and modify all public MediaWikiShibboleth messages. The translations can be found in the <mediawiki installation folder>/extensions/MediaWikiShibboleth/i18n. Dutch (nl.json) and English (en.json) translations are already provided. Even the provided translations can be customized, and we strongly advise you to do so, in order to match them with your Wiki situation.